Born on this day (March 20) was Frank Hutchison, one of the outstanding players in early recorded music, and one of the earliest white musicians to record blues. Hutchison was born in 1897 (per his birth certificate, though some sources suggest an 1891 date, see Mr. Scott’s comment below) in Logan County, West Virginia. He made his living working in the coal mines, but was also a versatile musician, skilled in guitar, which he frequently played using a slide, harmonica, and vocals. In September of 1926, Hutchison made his first recordings for the Okeh Phonograph Company, starting with one of his most famous numbers, “Worried Blues”. From 1926 to 1929, Hutchison cut forty-one sides, all for Okeh, and appeared on Okeh’s “Medicine Show” a set of records highlighting Okeh’s top hillbilly artists, much like Columbia’s “A Corn Licker Still in Georgia” series, and so forth. After making his records and ending his work in the coal mines, he opened a store and served as postmaster of Lake, West Virginia. Tragically, Hutchison lost everything and became an alcoholic when the store burned down. He later relocated to Ohio and worked as a musician on riverboats. Hutchison died of liver disease in 1945. Okeh 45313 was recorded September 10 and 11, 1928 in New York City by Frank Hutchison. These were Hutchison’s only sessions in 1928, and the latter was his second to last session overall. As were a great many of Hutchison’s recordings, the humorous “The Burglar Man”—an old time song also recorded by the likes of Uncle Dave Macon—is nothing short of a guitar masterpiece. This side was recorded on the latter date. 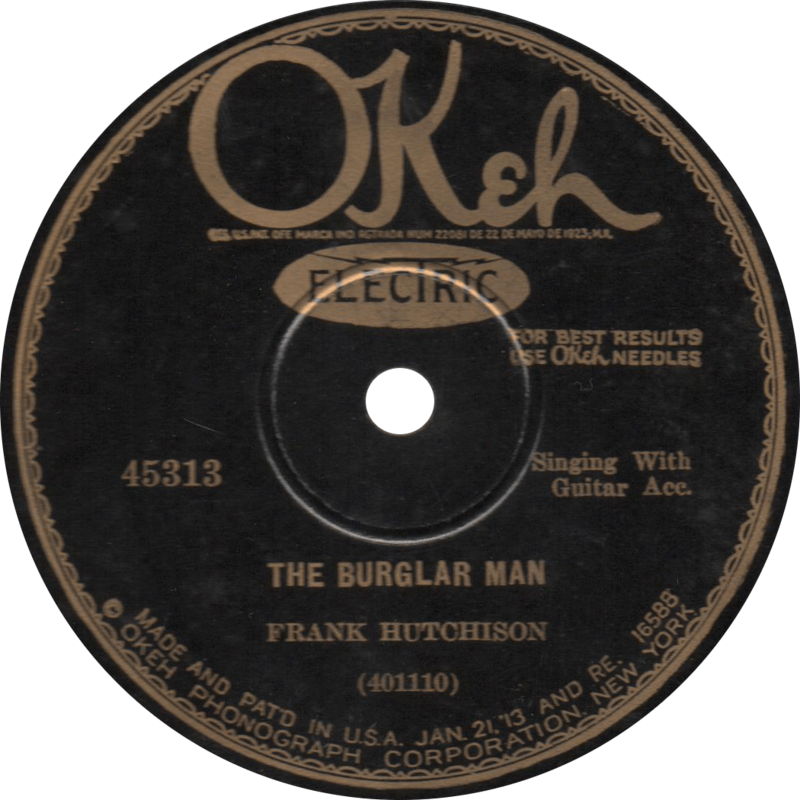 The Burglar Man, recorded September 11, 1928 by Frank Hutchison. On his rendition of the old minstrel song “Alabama Girl, Ain’t You Comin’ Out Tonight?”, Hutchison is joined by Sherman Lawson on fiddle. This one is one of three issued Hutchison sides to feature Lawson. This side was recorded on the September 10 date. 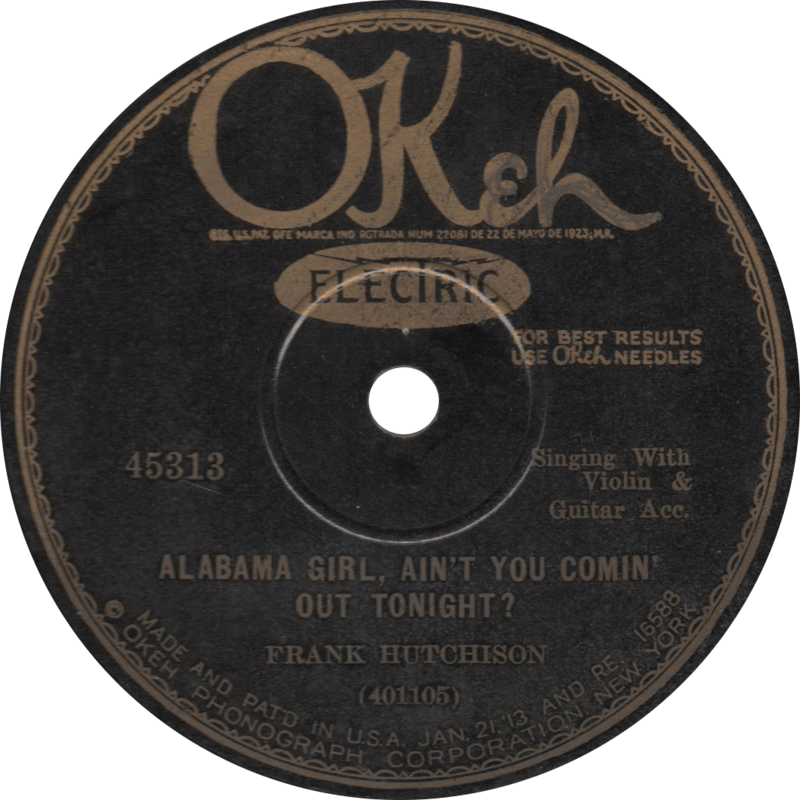 Alabama Girl, Ain’t You Comin’ Out Tonight, recorded September 10, 1928 by Frank Hutchison. Updated with improved audio on September 11, 2017, and on October 29, 2017. This entry was posted in Records and tagged 1920s, 1928, Folk, Frank Hutchison, Hillbilly, New York, Okeh, Old Time, Sherman Lawson, Singing with Guitar by R. Connor Montgomery. Bookmark the permalink. Frank Hutchison was born during the 1896 to 1898 period per his WWI draft card, the 1920 census, the 1930 census, a marriage record, and his death certificate.